Thinking back to the start of 2018, there was a sense of optimism, positivity, and hope, largely because we had just seen the removal of Jacob Zuma and the appointment of Cyril Ramaphosa as president. However, despite this optimism, reality quickly set in as the effects of a decade of corruption and mismanagement became evident. Increases in VAT and fuel prices worsened the mood and put the South African consumer under more pressure and business confidence fell to near all-time lows. The general feedback from the management of listed businesses in SA was that 2018 was the worst year experienced since 1994, including the years that followed the global financial crisis. Not a year most South Africans would want to relive! However, amongst all this negative news we believe that there were significant positive steps taken towards Cyril Ramaphosa’s New Dawn. Here are five key areas where progress can be seen and look at what 2019 has to offer and why it is such an important year for our beloved country. On 1 November 2018 Cyril Ramaphosa accepted the recommendation of the SARS commission of inquiry chairman, Judge Robert Nugent and fired Tom Moyane, the SARS commissioner. His exit ended a dark period in SARS’ history, which resulted in dozens of experienced and skilled employees leaving the tax agency. Ensuring SARS operates effectively is paramount to South Africa as 90% of our budget comes from tax revenue collected which forms the basis of a fiscal framework. Judge Nugent stated in his report that “the breakdown of SARS was inevitable the minute Tom Moyane was appointed commissioner. He arrived without any integrity and then dismantled the elements of governance one by one.” Moyane challenged the decision and in December 2018 the High Court rejected his application to be reinstated. On a political front this was a significant victory for Ramaphosa as it was the first high-profile legal case in which a senior state official and staunch Zuma supporter had challenged Ramaphosa. Ramaphosa’s willingness to take the battle to Moyane was very positive as it sent a strong signal to his adversaries and other Zuma supporters. In August 2018, the much-anticipated State Capture Inquiry (The Zondo Commission) began. The inquiry was set up to investigate allegations of state capture and corruption by the Gupta family and Jacob Zuma. It saw former public servants, political leaders, and the heads of SA’s four big banks appearing and testifying before it. The commission has already started providing insights into the extent of the corruption and state capture managed during the last decade. The commission also led to the resignation of Nhlanhla Nene as the minister of finance after he admitted to meeting with the notorious family after having denied the meetings in 2015. Although losing a very capable minister like Nene was negative, his resignation reflected a potential changing attitude of our leaders towards honesty and integrity and the consequences if these are not met. Our economy desperately needs foreign direct investment (FDI), as investment into our country is one of the few ways in which we can create jobs and grow the economy. Under the Zuma administration, FDI decreased from 25% of GDP in 2008 to 18% in 2017. To achieve Ramaphosa’s ambition, our economy requires a 30% investment rate. Therefore, shortly after Ramaphosa was elected president he set a very ambitious goal of attracting $100bn over the next five years from FDI as well as local investment. It is estimated that a $100bn FDI into the country could lift GDP growth to 4% a year and grow employment by 2% a year .To assist with this task, Ramaphosa named four respected South Africans – Trevor Manuel, Phumzile Langeni, Jaco Maree and Mcebisi Jonas to lead a global investment roadshow promoting South Africa as an investment destination. As at the end of December 2018, about $35bn in FDI has been pledged so far, S15bn from China, and $10bn from both Saudi Arabia and the United Arab Emirates. On the local front, the key to investment revival was always business confidence and SA business was pessimistic about the country’s economy for most of 2018. However, at the Investment Conference in October 2018 there were signs of this changing. At the conference, Ramaphosa called the South African private sector to lead the charge in investing in the country. The outcome of the conference saw local businesses answering his call and pledging R130bn of capital into the SA economy over the next few years. One of the big criticisms of the Zuma administration was his bloated cabinet and the rapid growth in the public sector wage bill. In figure 1 we can see that compared to other emerging markets and OECD countries, SA has the highest government wage bill as a percentage of GDP. Our current cabinet is one of the biggest in the world with 35 ministers; compared to the United States at 15, the United Kingdom with 21, and Kenya with 18 ministers. However, we don’t have to look abroad for examples of a more frugal cabinet. Nelson Mandela had a total cabinet size 50 (28 ministers), Thabo Mbeki 50 (28 ministers) and Kgalema Motlanthe 47 (28 ministers) compared with Jacob Zuma/Cyril Ramaphosa 73 (35 ministers). Figure 1: Government Wage Bill (% of GDP). Source – OECD. The size of the cabinet is something that both Cyril Ramaphosa and Finance minister Tito Mboweni have acknowledged needs addressing, and in his State of the Nation address Ramaphosa announced that he would put together a task team to determine what the cabinet should look like in terms of size and departments. The report does not have an official due date, but because it will most likely recommend a significant reshuffle and restructure of the current cabinet, we can assume that these findings will be finalised and released post the elections, when Ramaphosa will hopefully have a clearer mandate. However, in the interim, Ramaphosa showed his intentions when he announced on 8 December 2018 that there would be no salary increases for his cabinet members for 2019. Since his election as president of the ANC, Ramaphosa has made it clear that one of his priorities was to address the dire situation at many of the SOEs. The failure of these SOEs has led to significant bailouts being required which has put severe strain on our already fragile fiscus. Ramaphosa’s first big action was to announce a new Eskom board in January 2018, which he mandated to appoint a new CEO and CFO. Since then he has appointed Pravin Gordhan as minister of public enterprise, replacing Lynne Brown, a strong Zuma ally. Gordhan has made some significant changes since being appointed, showing a very clear intention of tackling corruption. He has made several changes to the boards of Denel, Transnet, SA Express and further changes to Eskom which led to Eskom reducing the number of executives from 21 to 9 by way of removing or combining roles. Then in late December Gordhan announced that he had cancelled all senior Eskom official’s leave and that they were to be placed at the various power stations around the country to ensure that we did not experience any blackouts over the festive season. In our opinion, significant progress has been made to try and rectify the challenges facing these SOEs and to rid them of corruption. The focus in the first half of 2019 is undoubtedly going to be the national elections as so much rides on the outcome. The importance of the upcoming election and the ANC securing a majority (55% – 60%) is paramount for South Africa for three broad reasons. Firstly, it will give Ramaphosa a mandate/support in the ANC to implement changes and reforms aimed at reviving economic growth and eradicating corruption. An example of this would most likely be the much-anticipated cabinet reshuffle where we would finally see the likes of Bathabile Dlamini and other ‘Zuma loyalists’ being shown the door. Secondly, he will be able to focus on implementation rather than having to deal with factional infighting in the ANC. Lastly, we should also expect to get clarity on the land reform policy, something that if done in a rational manner can have significant benefit to the broader South African economy and provide foreign investors with the certainty they seek. However, it is still important to acknowledge that significant risks still remain, but we believe the positive changes we saw in 2018 have paved the way for 2019. For most of us 2018 was a year to forget, one that we are happy to see the back of. However, as we have highlighted, there were some significant positive steps forward that we feel have begun to pave the way for what can be a very positive 2019. Let’s not forget it took Zuma 10 years to destroy parts of our country, it would be unfair to expect Cyril Ramaphosa to correct all that damage in one year. 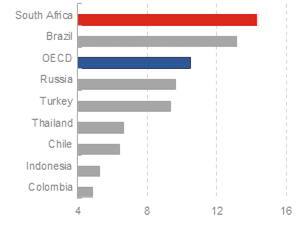 Data from the Global Infrastructure Hub confirms SA’s investment gap at $100bn.